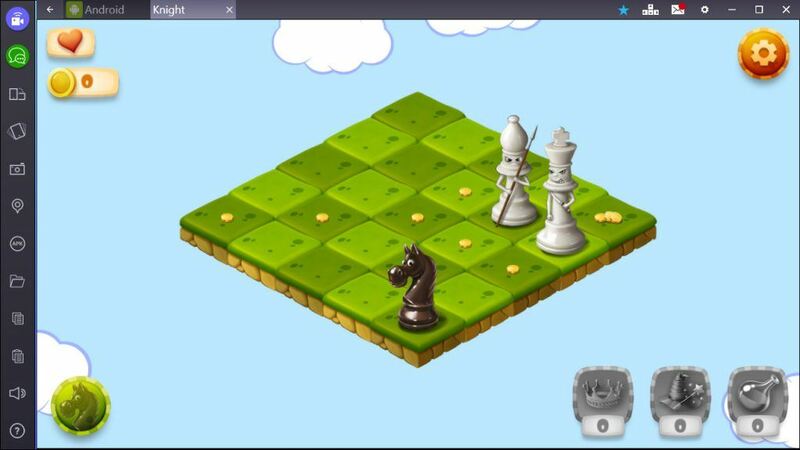 Knight’s Tour is a unique spin on Chess games. It focuses only on the Knight with it’s “L” shape moves. The goal is to collect all coins on the board while avoiding fiendish pitfalls. You’ll encounter numerous obstacles, fight chess-piece enemies, unlock achievements and new characters, use power-ups and all set in a beautiful world above-the-clouds. Play Knight’s Tour on phone, tablet or PC via BlueStacks and let’s get into the review! Learn Chess strategies with interesting twists! Unlock power-ups, over 100 levels, achievements to collect, plus a mini game! There are hints to move illustrated as green targets. In moving the Knight’s signature “L” shape you can land on green cells, which break and you can no longer use it if you step on it twice. The stone doesn’t break. If you step on small spikes you will lose coins (one coin per spike), step on a large spike and lose the round. At level 7 you unlock special power-ups. You can complete all levels without any bonuses (except this “extended level”). But with them, it’s much easier! With the Queen bonus the Knight becomes a Queen and is able to move any number of squares vertically, horizontally or diagonally. With the Wizard bonus the Knight can turn broken cells back to normal and remove spikes. With the Health Bottle bonus it heals the Knight and restores one heart. The King is an enemy, you can beat him. The King moves in any direction but limited to one move. The Bishop is another enemy. The Bishop moves diagonally in any number of spaces. Get tramped by these and the level is over. The Rook moves straight in any number of spaces… and so on. It’s important to stay a few moves ahead! Should you download Knight’s Tour? Yes! It’s a tricky game to master. 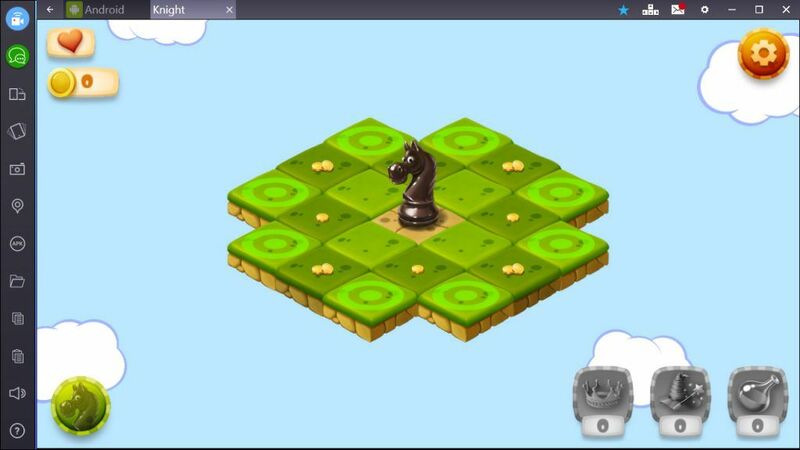 Using Chess tactics it teaches you to be a better player as levels and obstacles increase in difficulty. If you’re apart of BlueStacks Game Testers Community you can get the full version free. 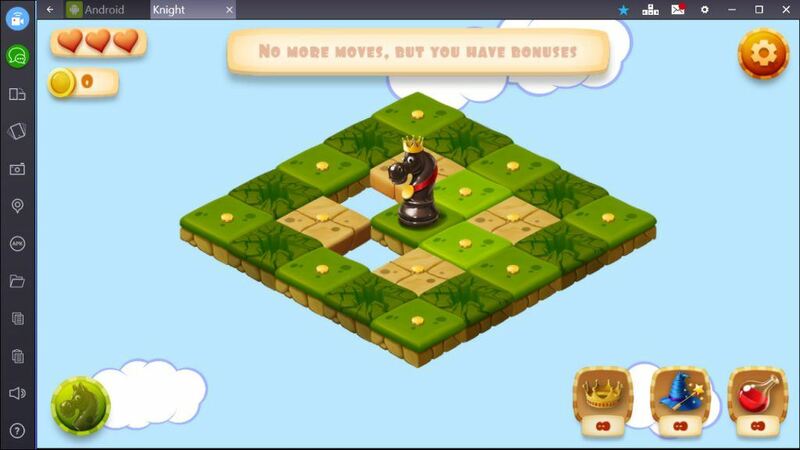 BlueStacks is the best way to play Knight’s Tour on PC… download now!